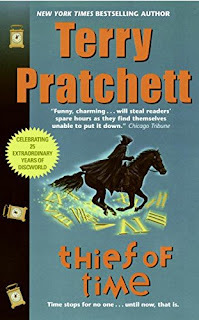 This final read for March Magics, Thief of Time, was also the only one I was reading for the first time. I was happy then to end the month with this smart, funny, thoughtful exploration of form, function, and time. This is another book with a complicated set of interwoven plots and characters. There are the Monks of History who live in one perfect day and manage time, shuffling it around when it is needed or is being wasted. There is Jeremy, a clockmaker in Ankh-Morpork who is a bit off but has been tasked with making an impossible device. There is Lobsang Ludd, former thief and current apprentice to Lu-Tse, a sweeper for the Monks. There are the Auditors, those grey hooded rule-makers who can't stand the diversity and unpredictability of human life. And then there is Susan and, of course, her grandfather, Death. Oh! And Nanny Ogg makes a couple of appearances! Love her. So, it was a bit confusing at first as each of the plots was starting up but by the end the stories clicked together like, well, clockwork. And there were two moments at the end that were some of the sweetest moments in the entire Discworld series. This is definitely my new favorite Death book. 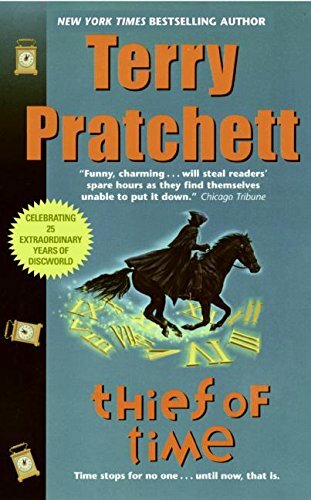 Pratchett really gets better through the years and is best when he couples complexity with depth while keeping his trademark humor and intelligence. Question of the Day: Death by chocolate is a real thing in this book. What food/treat, if made perfectly, would be the death of you? My answer? It would be a tie between snickerdoodle cookies (Martha Stewart's recipe ... LOADS of butter) and See's Dark California Brittle (almonds ... mmm ....). If I had either of those around regularly, I would die of overeating in a very short time. 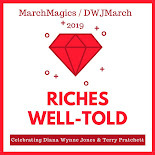 So, that's the end of March Magics and DWJ March! I hope you all enjoyed the event this year. I'm already thinking about next year's theme. But, even if we all just randomly picked books by Jones and Pratchett, we would be guaranteed to have an amazing experience. This is my favorite Death book too, and also has some of the best moments in Discworld. You put it well: he's best "when he couples complexity with depth while keeping his trademark humor and intelligence." Thanks for hosting again! Even though I didn't reread during the month, it was lovely to see all the activity and appreciation. Thank you for joining in so enthusiastically this year! I loved seeing readers new to DWJ or Terry Pratchett comment on your posts about going out to find books. I hope we have some new fans by this time next year! I didn't manage to do it in March, but I love your idea of reading all the Death novels (there are some I haven't read, and this is one of them), so I am going to make a point of doing it soon. He's just so darn wise, isn't he?